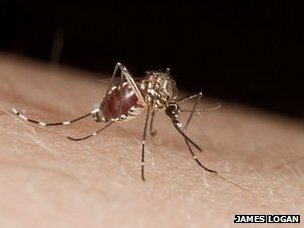 Researchers from the London School of Hygiene and Tropical Medicine say mosquitoes are first deterred by the substance, but then later ignore it. They say more research is needed to find alternatives to Deet, which was first developed by the US military. For many years, it was not clear exactly how the chemical worked, but recent research suggests that insects simply do not like the smell. However, there are concerns that some mosquitoes are growing resistant to it. To find out more, researchers from the London School of Hygiene and Tropical Medicine took some A. aegypti mosquitoes in the laboratory, and tempted them with a human arm covered in Deet. As expected, the repellent put the insects off their potential meal. However, a few hours later when the same mosquitoes were offered a chance to dine again, the researchers found that the Deet was less effective. To investigate why this might be happening, the researchers attached electrodes to the insects’ antenna. Dr Logan explained: “We were able to record the response of the receptors on the antenna to Deet, and what we found was the mosquitoes were no longer as sensitive to the chemical, so they weren’t picking it up as well. Earlier research by the same team found that genetic changes to the same species of mosquito can make them immune to Deet, although it was not clear if there were any mosquitoes like this in the wild. Dr Logan said it was vital to understand both these permanent genetic and temporary olfactory changes that were taking place. He stressed that the findings should not stop people from using Deet in high risk areas, but that they would help scientists who are trying to find new versions that could be effective. To follow up on the study, the researchers now plan to find out how long the effect lasts after the initial exposure to the chemical. The team would also like to study the effect in other mosquitoes, including the species that transmit malaria.